The golden age of Motown may have been over 50 years ago but if THE MAGIC OF MOTOWN: THE REACH OUT 10TH ANNIVERSARY TOUR is anything to go by, it’s still very much alive! 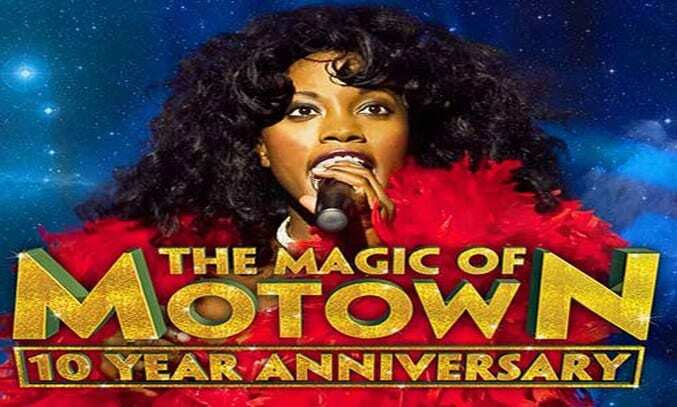 Described as an “explosive concert experience”, THE MAGIC OF MOTOWN is a feel-good musical celebration which pays tribute to popular Motown artistes of the 1960s and 1970s. Now in its 10th year, the scintillating theatre show has been seen by over one million people worldwide and continues to amass fans across the world. The two hour concert takes fans on a musical journey through the sound of Tamla Motown solid-gold artistes such as Marvin Gaye, Diana Ross, Stevie Wonder, The Temptations, The Supremes, Jackson 5 and Smokey Robinson. Fronted by seven singers – three women and four men – as well as live backing band of seven musicians, the show runs at a breath-taking pace, with back-to-back hits, glittering costume changes and dazzling dance moves from all of the cast. The best of the vocal performances come in the first half of the show with a Diana Ross medley of TOUCH ME IN THE MORNING and CHAIN REACTION and an impromptu acapella performance of Smokey Robinson’s TEARS OF A CLOWN standing out as a highlights. The 2017 tour also honours the 50th anniversary of The Four Tops’ chart-topping 1966 single REACH OUT I’LL BE THERE with a special performance by the cast. The second half of the show sees the band perform hits such as The Temptations’ MY GIRL, Stevie Wonder’s UPTIGHT and The Four Tops’ LOCO IN ACAPULCO, although a couple of other songs fall flat. An otherwise excellent performance of ENDLESS LOVE is spoilt by some cheesy ad-libbing by singer Andre Lajeune. There is also an awkward moment when an audience member is invited up onto the stage for the performance of MY CHERIE AMOUR only for the singer to leave her dancing alone on stage. While the team have clearly worked hard to put on a high-energy show, at times, the production does have a bit of an amateur feel to it. A daft impersonation of Stevie Wonder in which the singer appears on stage in a dreadlock wig and dark glasses spoils an otherwise great performance. Occasionally, the choreography is also out of sync and the video projection on back wall could have done with a little more thought. That said, you can’t fault the cast for their vocal performances, with all of the singers boasting incredible voices and diversity in style, tone and technique. The high energy Jackson 5 finale also has the audience on their feet and dancing in the aisles for BLAME IT ON THE BOOGIE, I WANT YOU BACK and I’LL BE THERE. If you’re a fan of Motown, you’re sure to enjoy THE MAGIC OF MOTOWN: THE REACH OUT 10TH ANNIVERSARY TOUR. A high-energy show that pays tribute to the motor city and its music.